Glaucophane is an azure-blue, lavender-blue or bluish-black mineral; giving the rock its name, and color. Typically the prismatic glaucophane crystals line up resulting in a distinct schistose foliation. Lineated schistose foliation produced by the lining up of elongate amphibole (var. glaucophane) crystals; seen trending lower left and upper right in this image. 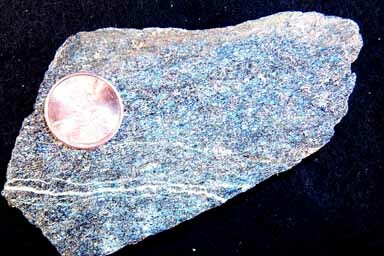 This is often a nondescript rock, easily confused with other rocks, especially amphibolite or various kinds of other schists. Aside from identifying the specific minerals, the most distinctive feature is the bluish color, although it often verges on black (making it even more confusing with amphibole). The bluish color is not always easy to see, however, especially under fluorsecent lights. The color in this image is exaggerated; in hand specimen it looks much more black, although in the right light the distinct blue color comes through. Amphibolite is associated with major mountain building events when mafic igneous rocks (basalts or gabbros) are metamorphosed through depth of burial, and proximity to batholiths (click picture for larger version).